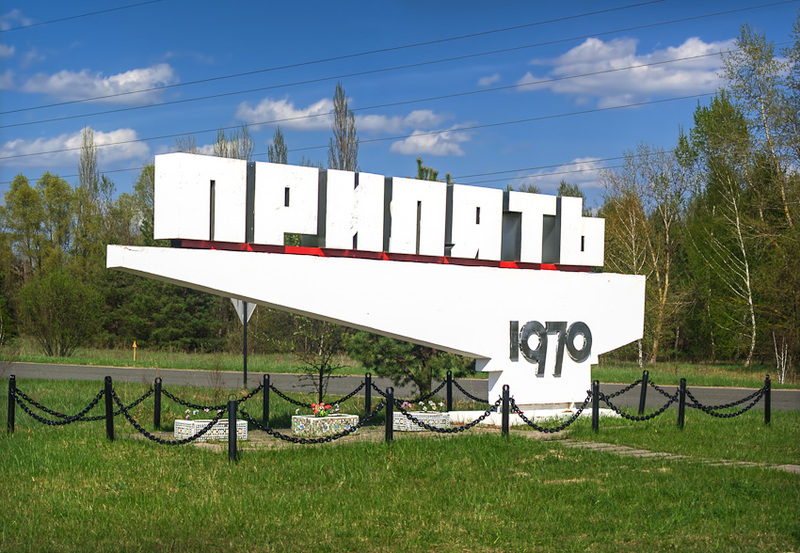 This sign marks the entrance to the town of Pripyat, established 1970. It probably ranks as one of the more recognizable spots in the Chernobyl area. Now, it's just a halfway point between the power plant and the center of Pripyat. The town of Pripyat was designed as a Soviet "model city." Designed from the ground up, it had all the modern conveniences anybody could want. Schools, a hospital, a cultural center, a movie theater, restaurants, a stadium, playgrounds, and an Olympic sized indoor pool. Yet this model city, still under construction and still growing in the mid 1980's, would meet an abrupt end. Thirty-six hours after the Chernobyl explosion, the city faced a mandatory evacuation. Residents were to gather their papers and essential belongings and board a bus for mandatory evacuation. By necessity, to get people out as quickly as possible, it was necessary to severely restrict the amount of personal belongings they could take with them. They were told they would likely return in three days. Telling people this would be permanent would encourage people to smuggle out things better left behind. This three day evacuation will in the near future be thirty years. Furniture, clothing, family pets, heirlooms. Left behind, abandoned, and sacrificed on the alter of a nuclear promise gone awry.